Opener has announced that its Personal Aerial Vehicle (PAV), dubbed BlackFly, has passed US regulatory hurdles. This makes BlackFly the first "USA-Qualified Ultralight All-Electric Personal VTOL Aircraft". In short, BlackFly is a single-person vehicle which can fly autonomously, and offers a range of up to 25 miles at a speed of 62mph. It will eventually cost about the same as a typical SUV, and heralds the start of the Jetson's lifestyle era, according to an Opener exec. The Opener BlackFly is a project partly funded by Google co-founder Larry Page, notes the BBC news. Opener is based in Palo Alto, not far from the Google HQ. Page also backs rival flying car designs by US startup Kitty Hawk. There are several other flying car projects worldwide. Talking about BlackFly, at its unveiling yesterday, Opener CEO Marcus Leng said "Opener is re-energizing the art of flight with a safe and affordable flying vehicle that can free its operators from the everyday restrictions of ground transportation". Leng went on to promise affordability, to "democratize three-dimensional personal transportation," and insisted that safety will be paramount during the flying cars development and testing. It is notable that to pilot a BlackFly you won't need a pilot license but Opener will mandate that purchasers complete the FAA Private Pilot written examination plus extra vehicle familiarisation and operator training. Talking to CBS News, Leng described the simple flying experience on offer. "When you press the thumb-stick to climb, you have absolute full control. When you stop in the middle of the air and go off the joystick, the aircraft freezes. And when I say freezes… it literally freezes in the air." And remember, it can fly autonomously, likely to be interfaced with some smartphone app, and has a return home button. Considering other technical aspects of the vehicle, it has eight propulsion systems, spread across two wings, provides for multiple-failure security, and the fault-tolerant design and triple modular redundancy should strengthen that safety assurance. For further safety, this amphibious capable vehicle has a ballistic parachute option available. Opener's flying car tech has been in development for 9 years, with 1400+ flights, and 12000+ miles under its belt. Being electric, the BlackFly would ideally be powered by a renewable energy source, like home solar panels or wind turbine generators. 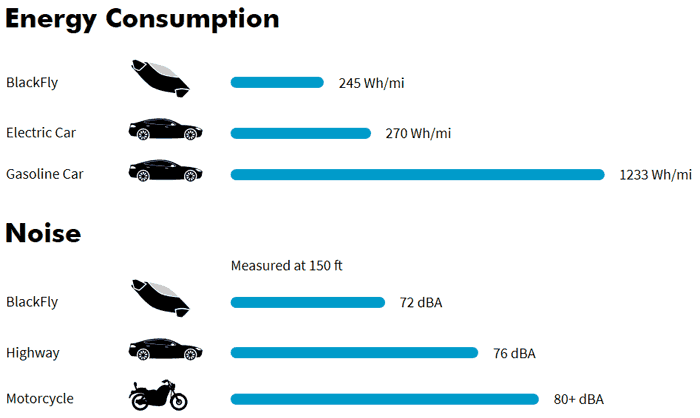 Above you can see claims for efficiency, and it is said that the BlackFly can be 'super charged' in under 30 mins. At least they're calling it a VTOL aircaft and not a flying car. That looks horrifically cramped… and at 25 mile range, I'd still rather have one of the PAL-V series!! 25 miles isn't far is it, when you need charging infrastructure when you get there. If this sort of thing ever really happened, I guess we would need way more little airfields all over the place. The nearest to me is 5 miles away, and if I have to get in the car anyway I might as well just drive to where I want to go. Strikes me as the sort of thing you would want to hire for the afternoon for kicks not practicality.